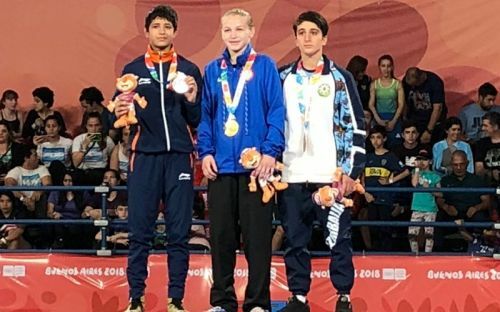 India won their eighth medal at the third Youth Olympics after Simran bagged silver in the Girl's Freestyle 43kg wrestling event. The Cadet World Bronze medalist lost 6-11 to USA's Emily Shilson after the grappler had taken a huge 9-2 lead in the first few minutes of the bout. The continued good show of the Hockey 5s team, where both the Men's and Women's side qualified for the finals, thus assuring India of two more medals, capped off a highly successful day for the contingent at Buenos Aires. Here is how Team India fared on October 13 (Day 7) of the competition. Mixed International Team 1/16 Elimination Round - Himani Kumari with South Africa's Wian Roux lost 1-5 against Great Britain's Tromans Ansell and Iran's Reza Shabani and did not qualify. Akash with Turkey's Selin Satir won 5-3 against Dominican Republic's Stefany Jerez and Brazil's Mateus de Carvalho and qualified for the Round of 16. Men Semifinal - India defeated Argentina 3-1 with Rahul Rajbhar scoring a goal and Sudeep Chirmako netting a brace. India will play Malaysia in the summit clash. Women Semifinal - India defeated China 3-0 with Mumtaz Khan starting off the goal-scoring in the very first minute of the match. Reet and Lalremsiami scored goals as well. India will clash with Argentina in the finals. Mixed International Team Preliminary Stage - India lost to Azerbaijan 0-3 but scripted wins over France and Argentina to finish 2nd in the Group Stage.